The SR785 Two-Channel Dynamic Signal Analyzer is a precision, full-featured signal analyzer that offers state-of-the-art performance at a price that's less than half that of competitive analyzers. Building on its predecessor, the SR780, the SR785 incorporates new firmware and hardware that make it the ideal instrument for analyzing both mechanical and electrical systems. 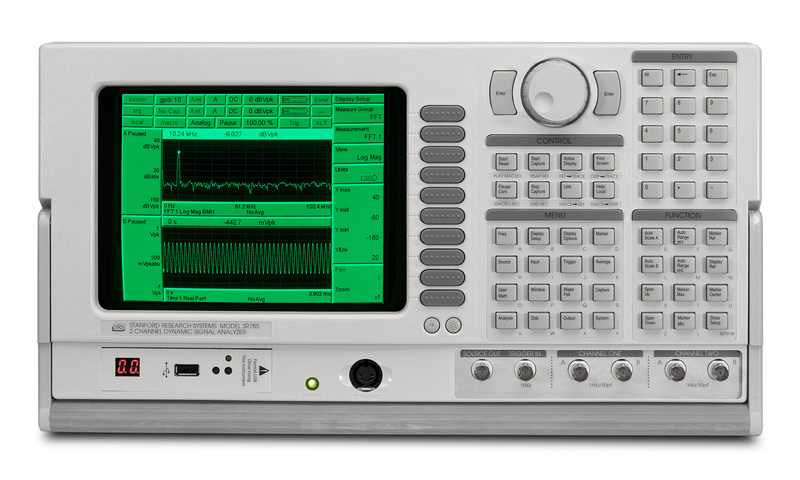 The SR785 Two-Channel Dynamic Signal Analyzer is a precision, full-featured signal analyzer that offers state-of-the-art performance at a price that's less than half that of competitive analyzers. Building on its predecessor, the SR780, the SR785 incorporates new firmware and hardware that make it the ideal instrument for analyzing both mechanical and electrical systems. For measurements involving servo systems, control systems, acoustics, vibration testing, modal analysis, or machinery diagnostics, the SR785 has the features and specifications to get the job done. Standard measurement groups include FFT, order tracking, octave, swept-sine, correlation, time capture, and time/histogram. 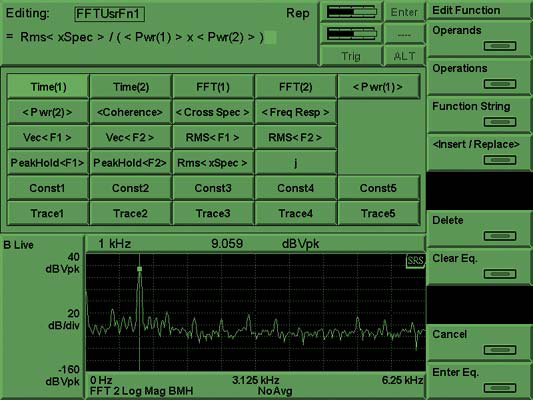 The SR785 brings the power of several instruments to your application: a spectrum analyzer, network analyzer, vibration analyzer, octave analyzer and oscilloscope. A unique measurement architecture allows the SR785 to function as a typical dual-channel analyzer with measurements like cross spectrum, frequency response, coherence, etc. 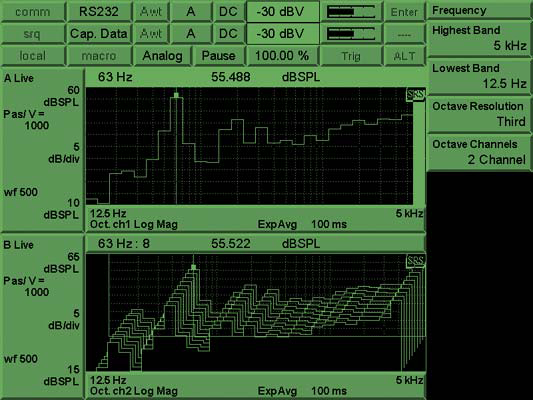 Alternatively, the instrument can be configured so that each input channel functions as a single-channel analyzer with its own span, center frequency, resolution and averaging. This allows you to view a wide-band spectrum and simultaneously zoom in on spectral details. The same advanced architecture provides storage of all measurement building blocks and averaging modes. Vector averaged, rms averaged, unaveraged, and peak hold versions of all measurements are simultaneously acquired and can be displayed without re-taking data. The SR785 comes equipped with a wide selection of averaging techniques to improve your signal-to-noise ratio. RMS averaging reduces signal fluctuations, while vector averaging minimizes noise from synchronous signals. Peak hold averaging is also available. Both linear and exponential averaging are provided for each mode. Because the SR785 is so fast, there's no need for a separate "fast averaging" mode. For instance, in a full-span FFT measurement with a 4 ms time record, 1000 averages take exactly 4 seconds, during which the SR785 still operates at its maximum display rate. For impact testing, the average preview feature allows each time record or spectrum to be accepted or rejected before adding it to the measurement. Order tracking is used to evaluate the behavior of rotating machinery. Measurement data is displayed as a function of multiples of the shaft frequency (orders), rather than absolute frequency. Combined with a waterfall plot, the SR785 provides a complete history or "order map" of your data as a function of time or rpm. Using the slice feature, the amplitude profile of specific orders in the map can be analyzed. In tracked order mode, the intensity of individual orders vs. rpm is measured. Unlike other analyzers, there's no need to track a limited number of orders to ensure full speed measurements. The SR785's speed allows simultaneous tracking of up to 400 orders. Run-up and run-down measurements are available in both polar and magnitude/phase formats. RPM profiling is provided to monitor variations of rpm as a function of time. A complete selection of time and rpm triggering modes is included, allowing you to make virtually any rotating machinery measurement. Real-time 1/1, 1/3 and 1/12 octave analysis, at frequencies up to 40 kHz (single channel) or 20 kHz (two channel), is a standard feature of the SR785. Octave analysis is fully compliant with ANSI S1.11-1986 (Order 3, type 1-D) and IEC 225-1966. Switchable analog A-weighting filters, as well as A, B and C weighting math functions, are included. Averaging choices include exponential time averaging, linear time averaging, peak hold, and equal confidence averaging. Broadband sound level is measured and displayed as the last band in the octave graph. Total power, impulse, peak hold and Leq are all available. Exponentially averaged sound power (Leq) is calculated according to ANSI S1.4-1983, Type 0. Octave displays can be plotted as waterfalls with a fast 4 ms storage interval. Once data is stored in the waterfall buffer, the SR785 can display centile exceedance statistics for each 1/1, 1/3 or 1/12 octave band, as well as for Leq. 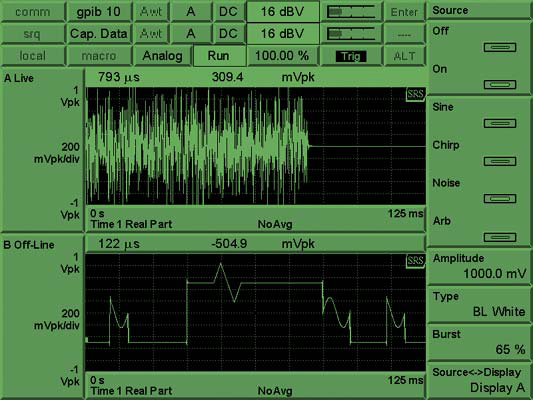 Swept-sine mode is ideal for signal analysis that involves high dynamic range or wide frequency spans. Gain is optimized at each point in the measurement, producing up to 145 dB of dynamic range. A frequency resolution of up to 2000 points is also provided. Auto-ranging can be used with source auto-leveling to maintain a constant input or output level at the device under test (to test response at a specific amplitude, for instance). Auto-resolution ensures the fastest possible sweeps and adjusts the frequency steps in the scan based on the DUT's response. Phase and amplitude changes that exceed user-defined thresholds are measured with high frequency resolution, while small changes are measured using wider frequency steps between points. A choice of linear sweeps with high resolution, or logarithmic sweeps with up to eight decades of frequency range, is provided. The time/histogram measurement group is used to analyze time-domain data. A histogram of the time data vs. signal amplitude is provided for accurate time domain signal characterization. Statistical analysis capabilities include both probability density function (PDF) and cumulative density function (CDF). The sample rate, number of samples, and number of bins can all be adjusted. The SR785 comes with 8 Mbytes of memory (32 Mbytes optional). 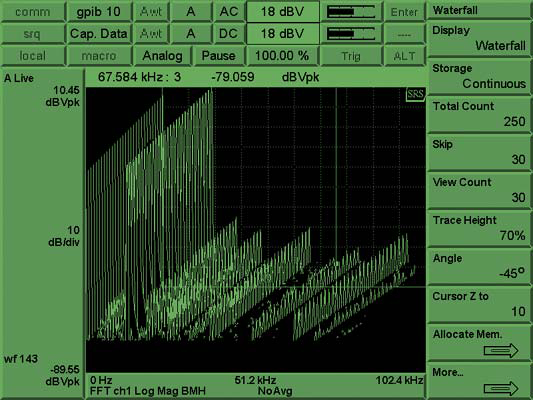 Analog waveforms can be captured at sampling rates of 262 kHz or any binary sub-multiple, allowing you to optimize sampling rate and storage for any application. For example, 8 Msamples of memory will capture 32 seconds of time domain data at the maximum 262 kHz sample rate, or about 9 hours of data at a 256 Hz sample rate. Once captured, any portion of the signal can be played back in any of the SR785's measurement groups except swept-sine. The convenient Auto-Pan feature lets you display measurement results synchronously with the corresponding portion of the capture buffer to identify important features. Automatic unit conversion makes translating transducer data easy. Enter your transducer conversion directly in V/EU, EU/V or dB (1V/EU). The SR785 will display the result in units of meters, inches, m/sec2, in/sec2, m/s, in/s, mil, g, kg, lbs., N, dynes, pascals or bars. Built-in ICP power is provided for accelerometers. Acoustic measurement results can be displayed in dBSPL, while electrical units include V, V2, dBV and dBm. The SR785 comes with six precision source types: low-distortion (-80 dBc) single or two-tone sine waves, white noise, pink noise, chirp, and arbitrary waveforms. The chirp and noise sources can be bursted to provide activity over a selected portion of the time record for FFT measurements, or to provide impulse noise for acoustic measurements. The digitally-synthesized source produces output levels from 0.1 mV to 5 V plus DC offset from 0 to ±5 V, and delivers up to 100 mA of current. Arbitrary waveform capability is standard with the SR785. Use the arbitrary source to playback a section of a captured waveform, play a selected FFT time record, or upload your own custom waveform from your computer. Custom measurements can be created in each of the SR785's measurement groups using the math menu. Enter any equation involving rms averaged, vector averaged or unaveraged time or frequency data, stored files, constants, or a rich array of supplied operations including arithmetic functions, FFT, inverse FFT, jΩ, d/dΩ, exp, ln x and many others. All of the averaging modes are available as user math operands. Unlike many other analyzers, the SR785's measurement rate is virtually unaffected when user math is selected. For instance, the function exp(ln(conj(FFT2/FFT1))) can be calculated with a 100 kHz real-time bandwidth. Waterfall plots are a convenient way of viewing a time history of your data. Each successive measurement record is plotted along the z-axis making it easy to see trends in the data. All FFT, octave and order tracking measurements can be stored in the SR785's waterfall buffer memory. You can choose to save all measurements and averaging modes, or just the current measurement to conserve memory. Waterfall traces can be stored every n time records for FFT and order tracking measurements. For order tracking measurements, new records can be acquired at a specific time interval or change in rpm. In octave measurements, the storage interval is in seconds (as fast as every 4 ms). While displaying waterfall plots, you can adjust the skew angle to reveal important features, or change the baseline threshold to eliminate low-level clutter. Any z-axis slice or x-axis record can be saved to disk or displayed separately for analysis. 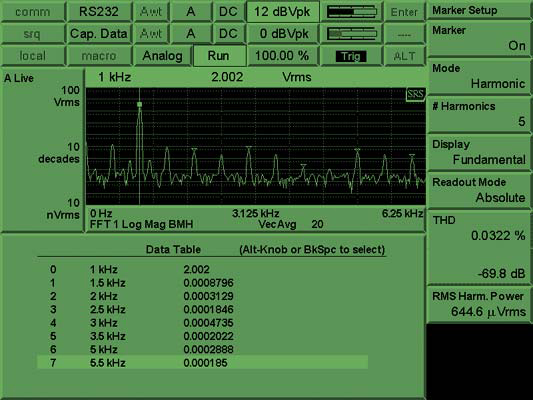 The SR785 includes a wide variety of built-in analysis features. 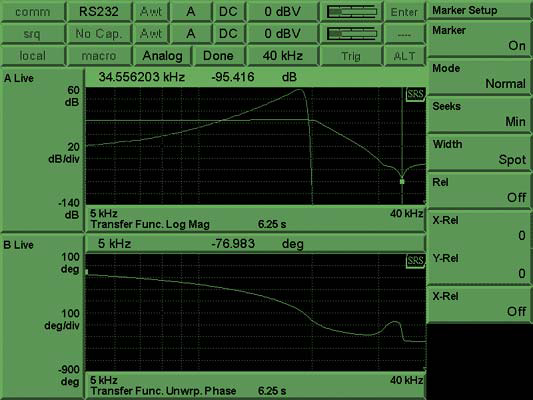 Marker analysis lets you easily measure the power contained in harmonics, sidebands or within a given band of frequencies. Important information such as THD, THD+N, sideband power relative to a carrier, or total integrated power are calculated in real time and displayed on the screen. The front/back display feature allows you to display live data from both signal inputs on one graph. You can also simultaneously display saved traces and live data. 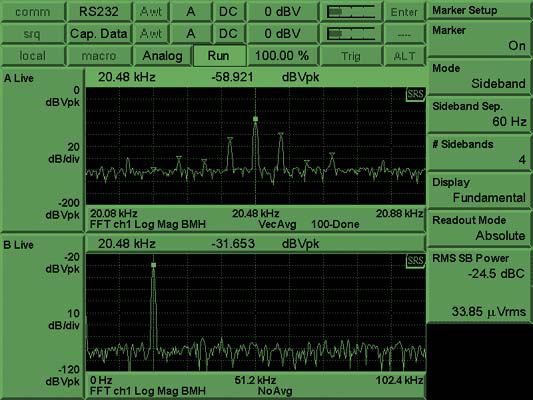 The peak-find marker allows you to quickly locate frequency peaks with the click of a button. The marker statistics feature calculates the maximum, minimum, mean and standard deviation of data in any section of the display. For modal analysis, the cursor can be configured to display the resonant frequency and damping of a single selected mode. Data tables are used to display up to 100 selected data points in tabular format. Limit tables allow you to define up to 100 upper and lower limit segments in each display for GO/NO-GO testing. The SR785 has a 20-pole, 20-zero curve fitter that can fit frequency-domain data from both the FFT and swept-sine measurement groups. Curve models can be displayed in pole/zero, pole/residue and polynomial formats. Synthesis reverses the process; enter a model in any of the above formats and the SR785 synthesizes the required curve. The curve-fit/synthesis menu allows you to change gain, delay and frequency scale, set pole and zero locations, and instantly see the response of the modeled system. 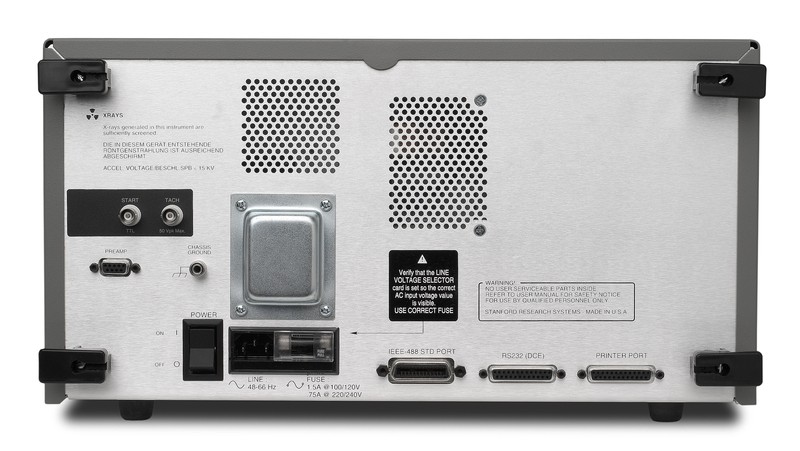 The SR785's USB drive, computer interfaces (GPIB and RS-232), and printer port provide flexibility when saving, printing and exporting data. Data can be saved in binary or ASCII formats and displays can be printed/plotted to any of the ports or the disk drive. Supported formats include PCL (LaserJet and DeskJet), dot-matrix, postscript and HP-GL, PCX or GIF. An annotation editor lets you add text, time, date and filenames to any portion of the plot. The SR785 comes with a complete suite of data conversion utilities for both Windows and DOS operating systems. SR785 files can be converted to ASCII for use with spreadsheets, or Universal File Format (UFF) and HP SDF for use with modal analysis programs. SR785 files can also be converted to MAT file format for use with MATLAB. Conversion from external file types is also supported. Both HP SDF and SR780 files can be converted to SR785 format. Captures time data for later analysis (FFT or Octave). Up to 2 Msamples (8 Msamples optional) of data can be saved. 3.5", 1.44 Mbyte DOS formatted disk. Save data, setups and hard copy data. Print to Dot Matrix or PCL (LaserJet and DeskJet) printers. Plot to HP-GL or Postscript plotters. Print/Plot on-line (RS-232 serial, Centronics parallel or IEEE-488.2) or to disk file. EPS, GIF, PCX graphic formats also available for disk storage. Data, waterfall and capture files can be converted to ASCII. Data files can also be converted to Universal File Format, SDF format or MATLAB MAT-File Format. SDF and SR780 files can be converted to SR785 format. Windows based graphics program for viewing SR785 files. Graphs can be pasted to the clipboard or saved in PCX, BMP or GIF. Specifications apply after 30 minutes warm-up and within 2 hours of last auto-offset. Measured with 400 line resolution and anti-alias filters enabled unless stated otherwise. FFT spans 195.3 mHz to 102.4 kHz or 191 mHz to 100 kHz. The two displays can have different spans and start frequencies. Dynamic range 90 dB typical, 80 dB guaranteed (FFT and Octave). 145 dB typical (Swept-Sine). Includes spurs, harmonics, intermodulation distortion, and alias products. Excludes alias responses at extremes of span. Single channel ±3.0 deg. relative to external TTL trigger (-50 dBfs to 0 dBfs, freq <10.24 kHz, center of frequency bin, DC coupled). For Blackman-Harris, Hanning, Flat-Top and Kaiser windows, phase is relative to a cosine wave at center of time record. For Uniform, Force and Exponential windows, phase is relative to a cosine wave at beginning of the time record. External Level adjustable to ±5 V in 40 mV steps, positive or negative slope. Post-trigger Measurement record is delayed up to 100,000 samples after the trigger. Pre-trigger Measurement record starts up to 8000 samples prior to the trigger. Record length 2 Msamples (playback from arbitrary waveform memory or capture buffer). Variable output sample rate. Interfaces IEEE-488.2, RS-232 and Printer interfaces standard. 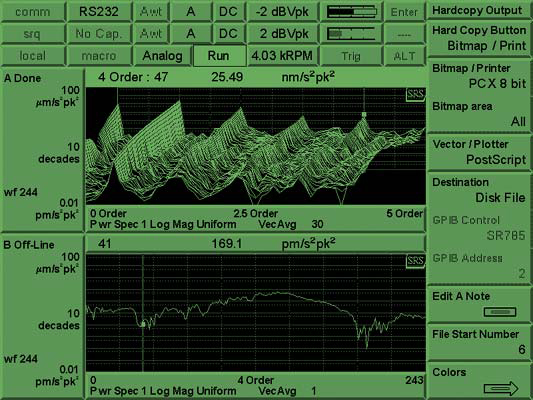 All instrument functions can be controlled through computer interfaces. A PC (XT) keyboard input is provided for additional flexibility. Hardcopy Print to dot matrix and PCL compatible printers. Plot to HP-GL or postscript plotters. Print/plot to RS-232 or IEEE-488.2 interfaces or to disk file. Additional file formats include GIF, PCX and EPS.